Fancy giving tennis a go? If you haven’t yet had the Tennis Experience, Dave and Charlie can’t wait to meet you! Junior or adult, beginner or more experienced, come and try any one of our sessions for FREE! All equipment is provided and our professional, LTA-accredited tennis coaches are ready to give you agreat experience. Booking is essential, as we have limited spaces available. If these sessions aren’t suitable for your age/ability or you can’t make these times, don’t worry! Call 0115 876 1600 to arrange a FREE trial at a time that suits you. Dave and Charlie are ready to show you the Tennis Experience! Dave is an experienced coach who has taught players of all levels from tots to teens to adults. 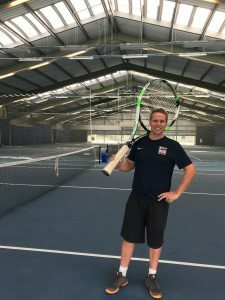 Dave was awarded LTA Coach of the Year for Great Britain in 2010 and has worked with players from complete beginners all the way up to junior international level. Charlie is the highest qualified coach on the Nottingham Tennis Centre team with experience of coaching players all around the world. Charlie specialises in adult coaching but has an outstanding way of bringing the game to life for all age groups.